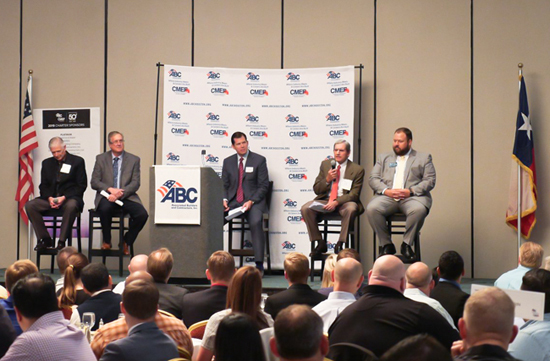 Brandon Mabile, Chairman of the board for ABC Houston and business development manager for Performance Contractors, preluded the panel discussion by stating ABC Houston’s missions in advocating for legislative policies that support the merit shop construction industry. “In Austin the session has begun, and we have some bills we’d very much like to get passed to continue to preserve free enterprise and our right to do business in a way we see fit…One of our biggest priorities this year is the fair and open compensation act, which would guarantee that government contracts cannot include mandatory PLAs,” he said. Mabile also spoke to the importance of the organization and its members investing in the education and training of current and future workers. 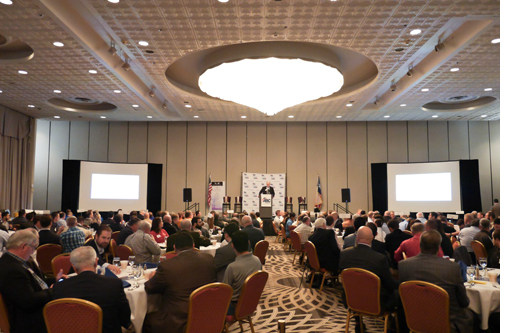 He mentioned that CMEF, the educational affiliate of ABC Houston devoted to workforce development, will double its number of students this year. Additionally, Mabile stressed the need to improve safety across the industry, encouraging all of ABC’s members to participate in the organization’s Safety Training and Evaluation Program (STEP). “As we improve safety we’re going to improve workforce development and we’re going to improve our bottom line because a safe jobsite is a productive jobsite,” he said. Along with Brandon Mabile, the panel consisted of Roger Berry, President of Senior Living and Campus Housing Division for SpawGlass Construction; John Golashesky, Senior Vice President and Regional Manager for Turner Industries; and Stan Marek, CEO of MAREK. Ben Westcott, with Andrews Myers and Chair of ABC Texas, moderated the panel and explained that the ABC Houston Chapter was started in 1969 by an Executive with Brown and Root after his company was targeted by the AFL-CIO. Stan Marek then gave a brief history lesson on how the merit-shop construction industry in Houston began and the role that MAREK played in that process. “We started in 1938 as a residential contractor, and we saw very quickly after the war that anything that was done with a metal stud was done union,” he said. In 1969, Brown and Root came to Marek’s Founder, Ralph Marek, and said, "Ralph, we’re building a 6-story building on our campus on Clinton Dr. and we’re going to do it open shop...we need your help." Marek went on to explain that that building was probably the first multi-story building in Texas built open-shop, and that sort of set the scene. John Golashesky and Roger Berry both spoke to how their companies experienced success and growth over the years after switching from union to merit-shop. Golashesky also spoke of the importance of like-minded merit-shop construction companies working together through organizations like ABC to advocate for legislation that will benefit them all. “Our company is very engaged in politics…what ABC is about is free enterprise…those of us who are members, we could not afford the legal expense to fight the battles. You can be a member of ABC for a fraction of the cost…We’re stronger as an association than any company individually,” he said. Berry added, “As time went on, ABC was a great resource for fighting the union during political battles, and I think it’s been a great success. Marek mentioned that one of the areas that the merit-shop industry can improve is attracting, educating, and maintaining the current and future workforce. He also stressed the need for a fix to the problem of worker misclassification, where sub-contractors file workers on 1099's and don’t pay employment taxes. This allows dishonest companies to undercut and underbid contractors who follow all the rules and treat their workers like employees by providing them with workers' comp and proper safety training. “I think that the only place we as an industry and ABC have fallen is protection of our labor force… In our industry, misclassification has become a terrible scourge-people being paid as independent sub-contractors, people working for labor brokers who don’t pay taxes, it’s a problem,” said Marek. Golashesky then talked about how the training programs and free enterprise principles that ABC provides and promotes are good for business. “Craft training and free enterprise enables the contractors to be aligned with the owners so you’re looking at projects that are going to profit driven and risk averse, and this gives them a much better chance of getting projects done on time and under budget,” he said. Mabile stressed the need to fight back against the unions in local, state, and national politics by advocating for free enterprise legislation, especially before increasing migration of Democrats to Texas’ growing urban areas turns Texas purple. “Around the country the unions are still fighting, and they have targeted Houston again. There’s a reason there are four new union training centers in the Pasadena area. They can steal money from their employees’ paychecks and use them for political funds that we can’t do… the government is going to try to tell us at the city level, as the cities in Texas get bluer and bluer, how we’re supposed to run our business, which are the things we’re trying to stop,” he said. “The Democrats have been talking for years about how they’re going to turn Texas blue,” Mabile continued. “If you look at the demographic shift of people coming to this state from the west and east coast, we’re gaining about 70,000 people a year, and most of them are coming from where they completely have ruined their own economy with the way they voted, to enjoy the economy with the way we’re voting. There’s a mental disconnect there, and they’re going to ruin our economy the same way they ruined theirs. If you look at what’s going on in the cities, this state will turn purple and it will turn blue…While we have control, we need to pass pro-merit shop and pro-free enterprise laws,” he said. Marek stressed the need for solutions to the workforce shortage in the construction industry that he is expecting to get worse. “Baby Boomers, those of us who were born before 69’, are getting out of the industry. Look at our high schools, how many kids are coming into the trades? Damn few. And guess what, a lot of our Latinos, legal and undocumented, are leaving Texas. We have all this work coming up… we’re going to get $1.8 Billion in Harvey relief funds, half those houses that were damaged have not been fixed, somebody has to do that, and all of us commercial contractors already have more work than we can do. Now is that not a recipe for disaster?” he warned. Marek also explained how workforce shortages have led to rampant worker misclassification and that the best way to fix the problem is through immigration reform that will provide a method to ID and tax undocumented workers properly. Marek’s closing message to the ABC members in attendance stressed the importance of solving the workforce shortage and misclassification issues now in order to protect free enterprise and the merit shop industry from unions in the future. “We’ve got to get active politically, we’ve got to solve this immigration mess, we need to clean up the misclassification issues, and we need to get into our high schools and show those kids we have a career path for them with good solid training like these guys have...Do you realize the residential industry in this city is bigger than the commercial and road building industry together? That’s a lot of labor…It’s tough to look ahead and realize how ill-prepared we are. Believe me, we are going through a republican cycle, the democrats will be back in office, and they are very pro-labor. If we don’t get strong and attract people into the trades, we will have someone else telling us how to do that, and we don’t want that,” he said. Marek also mentioned a new documentary video series called The Rational Middle of Immigration that seeks to inform the general public, shape sensible policy solutions, and create a deeper understanding of immigration. “We want people to be educated about the rational middle of immigration so they can vote for people who think like they do. We’re also providing political cover for our politicians. It’s very important that we solve this immigration problem,” he said. The above article was authored by Charles Frantes and originally published on TexasGOPVote.